After a rabbis' letter instructing Jews to not sell or rent apartments to Arabs, racist behavior reaches new low: An organization called Jews for a Jewish Bat Yam is expected to protest on Monday against the "assimilation of young Jewish women with Arabs living in the city or in nearby Jaffa." The protest will be held around 7:30 pm near the Bat Yam mall, not far from the police station. The organizers are also expected to show support for the controversial rabbis' letter. "It's a local organization of Bat Yam residents, because the public is tired of so many Arabs going out with Jewish girls," explained one of the organizers, Bentzi Gufstein. "In addition to the protest, we will hand out pamphlets explain the situation." The organization behind this local protest is actually the Lehava organization, which works to prevent intermarriage in Israel. The right-wing activist Baruch Marzel and a few local rabbis will participate in the demonstration, and the organizers are expecting hundreds more. During the past week, posters have been hung around the city calling residents to come out and protest. Some of the posters explain: "I will not allow them to hit on my sister! What would you do if an Arab hit on your sister? Put an end to it! Recently we have learned of a grave phenomenon: Hundreds of girls from Bat Yam and the center get together with Arabs, they are integrated amongst us, their confidence rising. Put an end to it! Lower their confidence!" 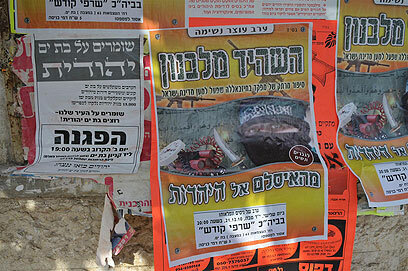 Another poster reads: "Keeping Bat Yam Jewish. Arabs are taking over Bat Yam, buying and renting apartments from Jews, taking and ruining Bat Yam girls! Around 15,000 Jewish girls have been taken to villages! Jews, come on, let's win!" Coincidently, the demonstration on Monday is supposed to take place on the street where former Knesset Member Tamar Gozansky (Hadash) lives. She told Ynet she intended to file a complaint with police against the organizers claiming they are inciting violence. "What they are saying is racist, another ugly stain on the Israeli conscience. I'm planning on complaining to the police on account that this is incitement according to clause 144 of the penal code, since such a demonstration can cause physical and emotional damage." Gozansky noted the October 2000 riots, in which Jews destroyed Arab businesses in the city. "It might happen again. It's part of a racist wave overflowing the country. The organizers received encouragement from the attorney general, who has yet to decide whether to do anything about the rabbis who signed the petition objecting to renting apartments to Arabs. The law authorities today are helpless, but the racist today act as if they are allowed to do anything." See all talkbacks "Bat Yam rally: 'Arabs dating our sisters'"